Are You Putting Your Dreams on Hold? Palliative care nurse Bonnie Ware asked people at the end of their life their #1 regret. Know what it was? Does this resonate with you? Why? The question is, What are you going to do about it? When are you going to do something about it? And please don't say, "Someday." If there's anything I've learned in the past few years, it's that SOMEDAY is not a day in the week. SOMEDAY is a path to - and a prescription for - regrets. Several years ago, I promised myself I'd "pull a John Grisham" and write first thing every morning. That's what Grisham did before he hit it big with his bestselling books. His dream was to write novels, but he was a full-time lawyer raising a family. He could have told himself he was "too busy to write." Instead, he got up at 5 am every day and wrote before he went into work. He's now living his dream because he bet on it instead of putting it on hold. If only I'd had the clarity and discipline of John Grisham. My good intentions to write every morning lasted a few weeks, then I hit the road for a month of speaking engagements. The next thing I knew my writing project was on the shelf ... again. It took a health scare for me to finally stop postponing my dream to make writing a priority. I’d been battling a respiratory infection for weeks, but “soldiered” through it because I had places to be, people counting on me. I kept hoping it would get better. It didn’t. The question is, why did I postpone what was calling me? Why do so many of us procrastinate on our dreams and true priorities when we know they would make us happier and healthier? We’re supposed to know better, right? Yet many of us continue to put off what’s important to us, idealistically assuming we’ll always have the option to do them later. How about you? Do you feel your life is not your own? Do you feel your current situation is “just the way it is” and there's nothing you can do about it? No. It’s not “just the way it is.” Certainly, there are some things beyond our control. Having a child with special needs is beyond our control. Having a parent with dementia is beyond our control. Our company going bankrupt and putting us out of work is beyond our control. In other words, we may not be able to control what happens to us; we can control what we do about it. You have more autonomy than you think. 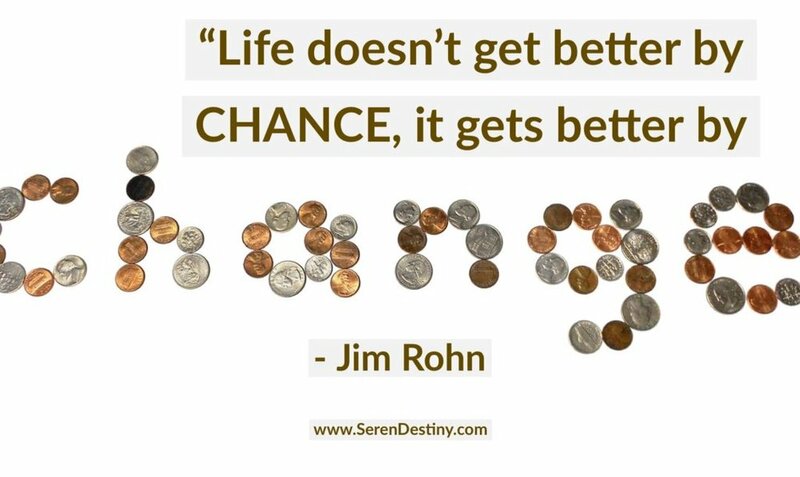 You may not be able to change your circumstances, you can change the way you deal with them. “Do you know the #1 prerequisite for change? A sense of urgency.” – John Kotter Please take a moment to look over the reasons below that people give for not doing more of what they want. Please ask yourself if any of these are true for you. 3. FAMILY RESPONSIBILITES: A woman told me, “I took a golden parachute deal from my company so I could retire early. What I didn’t anticipate was both my parents would be diagnosed with dementia. I’m now a full-time caregiver. This is not how I envisioned spending my fifties and sixties.” How about you? Are you so busy taking care of everyone else, there’s no time or energy left for you? Please understand, taking an hour a week do do something that makes you happy isn't selfish, it's smart. As Byron Katie says, "My happiness is on me, so you're off the hook." 4. WORK PRIORITIES: A Gallup poll reports “72% of people are uninspired and unhappy at work, yet 52% don’t take their full paid vacation.” What’s that about? Stanford professor Denise Brosseau told me, “In the Silicon Valley, it’s almost a badge of honor to ‘sleep under your desk.’ Sixty-hour weeks are the norm.” How about you? Does all your work have to be done before you make time for fun? Please understand, it's not indulgent to carve out time for fun; it's an investment in your mental and physical well-being. 5. HEALTH CHALLENGES: Are you dealing with aches, pains, a disability, injury or illness? Or, are you not exercising or eating right, but you're promising yourself you’ll take better care of yourself after the weekend's over? One way to make your life more of what you want it to be now is to start appreciating your "freedom of motion." Here's how. 7. “I DON’T KNOW WHAT I WANT.” A friend delivered the commencement address at her alma mater. The graduates took the stage for a group photo and, with a grand flourish, opened their robes to reveal t-shirts underneath that said, “I don’t know.” Sound familiar? It’s hard to go after what we want if we don’t know what we want. This 4 Boxes of Happiness Quiz can help kick-start your clarity. Did you relate to any of the above reasons? Please understand, even if these reasons have been true for you in the past, they don’t have to be true for you in the future. One of the many wonderful things about being a human being is we can change for good - on any given day. All we have to do is identify one thing we’re going to do differently and attach a sense of urgency to it so we’re motivated to do it now, not in the far off future. I told her, “Have a pretend S.E.E. to give yourself a sense of urgency." I said, “Okay, let’s hack that fear. One way to hack fears is to realize they don’t prevent things from going wrong; they prevent things from going right. The next day I received a three word text "I DID IT" accompanied by a photo of a smiling-from-ear-to-ear, dripping wet Beverly. What dream have you been postponing? Could you ask yourself, “What will matter a year from now?” and have a pretend S.E.E. to give yourself a sense of urgency so you’re motivated to act on it today? Aviation pioneer Chuck Yeager said, “At the moment of truth, there are either reasons or results." If you results instead of regrets, stop putting your dreams on hold. Bet on them, act on them today .. instead of promising yourself you'll do them someday. 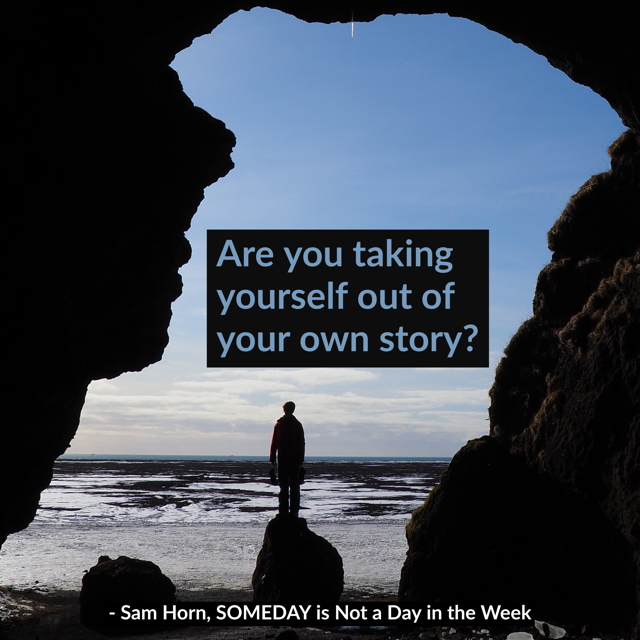 Sam Horn, CEO of the Intrigue Agency and author of SOMEDAY is NOT a Day in the Week, is on a mission to help people create a quality life-work thats adds value for all involved. Her TEDx talk and books Tongue Fu!, POP! and Washington Post bestseller Got Your Attention? have been featured in NY Times and presented to Intel, Capital One, NASA, Boeing, YPO, Cisco. “All right, let’s get more specific. How much time do you have?" "Ten days. Well, I get two weeks for vacation, but I want to save a couple days for something else just in case." When I moved on, they were animatedly discussing details of the trip. Kimberly's vague wish went from something she wrote in Square 2 to something that had already “come alive” in her mind and that had a much higher likelihood of happening. That is the power of using specifics to turn a SOMEDAY into a TODAY. That's the power of fleshing out the details of what you'd like to do so you're already mentally experiencing it. How about you? Is there something you hope to do LATER when you have more time, money, clarity, freedom, whatever? What if that never happens? Later may be too late. The key to turning an “I'd like to” into a “I will" is to fill out your W5 Form. The more W’s you picture for your project, the more “real” it becomes in your mind’s eye. Visualizing what you want with vivid W’s turns something vague into something visceral. What takes away a dream is not committing a date to it on your calendar. If you want results instead of regrets, fill out and post your W5 Form – What? Why? When? Where? Who? - where you’ll see it every day. The more detailed you get, the more invested you are, and the most invested you are, the more likely it is your dream will come true. So, what is something you've been planning to do later? How are you doing to set it in motion - even if that means putting a date on the calendar - NOW instead of waiting for the perfect time, place or person? "It gets late early out there." - Yogi Berra A participant at a recent conference asked in the Q & A, "How did you come up with the title of your upcoming book Someday is not a day in the week"
I told her, "I've met so many people over the past few years who talked about what they were going to do ... someday. Whether it was take more time for their family, take better care of themselves, or pursue a passion project ... they told me they planned (or hoped) to do it when they're not so busy, when their kids go off to college, when they retire, when they have more money, when things aren't so crazy at work ... fill in the blank. I shared Henry Miller's quote with the group, 'Life, for many of us, is one long postponement" and told them that many of us wait for perfect circumstances to take action on our dreams and passion projects. The problem with that? Our future is not guaranteed. The longer we wait, the more likely it is we'll never do what we want to do and we'll end up with regrets." How about you? What is something you want to do you've been postponing? What is something meaningful that could fill your life with joy, purpose and meaning? Please read and re-read Paulo Coelho's quote, "One day you're going to wake up and there won't be any time left to do the things you've always wanted to do." It's time to stop waiting and start initiating. You will never regret doing more of what puts the light on in your eyes, you will only regret not doing it sooner. You don't have to quit your job or abandon your responsibilities, just do one thing each week that makes you like your life. It doesn't have to be grandiose. Just one thing you enjoy and look forward to that makes you a bit happier and healthier." You might want to read the quotes below and select one that really sings to you. Print it out or write it out and tape it to your laptop or post it above your desk or on your frig. Keep it in sight, in mind so you keep your promise to make the rest of your life the best of your life. "Never, ever underestimate the importance of having fun." - Randy Pausch (Click here to discover why many of us only have FUN when our work is DONE). Please understand, one of these days is none of these days. Hope this post and these quotes inspire you to set something in motion today that creates a life that's more in alignment with your values and true priorities. Remember, we're never too OLD for NEW dreams ... and there is no present like the time - and no time like the present - to do more of what puts the light on in your eyes. "The minute you SETTLE for less than you deserve, you get even less than you settled for." - Maureen Dowd Have you been reasonable and responsible for so long, you habitually give up what calls you? What toll is SETTLING taking on your quality of life? I was headed to Los Angeles to work with some consulting clients. As I scrolled through the hotel options on Expedia, I noticed a deep discount on the Jamaican Inn in Marina Del Ray, only ten minutes from LAX. Let's see. A box hotel by the airport or a boutique hotel on the water for the same price? What shall I do, what shall I do? Suffice it to say I went with the more innovative option. While checking in, the front desk clerk asked, "Where you from?" "I'm in the middle of my Year by the Water." She was so intrigued with my adventure, she spontaneously upgraded me to a waterfront suite. I walked into the magnificent room and straight out onto the balcony. It was golden hour, that magical time of day right before the sun sets. I looked out at the palm trees and the boats, breathed in the sea air and marveled at the pelicans doing majestic fly-bys. In the middle of my reverie, a friend called for our monthly checkin. Glenna could tell from my voice how happy I was and asked, "What's going on?" I told her how much I loved being in this stunning room with its thrilling view of the marina. Yes I would, Glenna. Yes I would. Think of this as a metaphor. It isn't just about which hotel room we select. The essence of Glenna's insight was, "Have we been sensible and emotionally and fiscally frugal for so long, we no longer even ask for what would make us happy? Are we settling for parking lots when waterfront rooms are what we really want?" I understand the importance of being responsible, realistic and reasonable. Yet many of us are doing this to a fault. We have become so accustomed to compromising what we want and settling for less, it has become our default. Many of the people I met on my travels and interviewed for my SOMEDAY is Not a Day in the Week book told me it's been so long since they've had the freedom to do what makes them happy, they no longer know what that is. How about you? Have you been sacrificing what you want, or putting everyone else first for so long, you've forgotten what it feels like to do what calls you - even for an hour or a day? At some level, do you think you can't afford to do what makes you happy? Janis Joplin said, "We are what we settle for." Notice, she didn't say we GET what we settle for. She said we ARE what we settle for. Granted, as leaders, parents and partners, we need to put other people's needs first most of the time. However, we need to balance our service to others with service to ourselves. Doing what we really want - once in a while - is a gift that keeps on giving. I can hardly describe how happy it makes me to be in, on and around water. It makes my soul sing and my mind soar. It set up a happiness ripple effect that positively affects me, and everyone around me, for days. * What if I could play hooky for a day or an afternoon? * What would I do, where would I go, if there were no repercussions and all my responsibilities would be taken care of? * What would I do if I didn't have to be sensible, if I didn't have to settle? * What would I do if I could afford it? The answer(s) to those questions can reveal a "calling activity" that would lift your spirits and give you something joyful to look forward to. Life isn’t supposed to be a drudge. We are meant to be happy. Doing what puts the light on in our eyes - making time for a calling activity - isn’t indulgent, it’s inspiring. I am not suggesting we can - or should - do what we want ALL the time. We continue to take care of, and be financially and emotionally responsible to, the people counting on us. Yet we also take care of ourselves. And that means doing what makes our soul sing and our mind soar every once in a while – without apology or guilt. That means getting in, on or around water (or whatever lifts your spirits and makes your soul smile) instead of giving up what you really want and settling for the parking lot. Sam Horn, CEO of the Intrigue Agency and TEDx speaker - has the best of all worlds. Her work has been featured in NY Times and on NPR, taught to NASA, Intel, Boeing, YPO, Accenture, and she helps clients create one-of-a-kind books, TEDx talks, brands. Contact Cheri@intrigueAgency.com to work with Sam or arrange for her to speak to your group. “Don’t quit your day dream.” – Alicia Keys While watching the finals of The Voice and American Idol, something stood out about all the contestants, even though they came from wildly diverse backgrounds. None of them quit their day dream. Well, some did, for a while. Some gave up their music, discouraged by the rejection and the frustration of feeling they had talent that deserved to be noticed and appreciated – and that wasn't. But they kept a spark of hope alive, and summoned up the courage to audition even when the odds were against them. Even when their chances of success were slim. Instead of abandoning their dream, they bet on themselves and put their hope on the line. How about you? What’s your day dream? Have you always wanted to travel? Write a book? Start your own business? Learn to play guitar? Get involved in community theater? Have you set aside that dream? Did someone talk you out of it or did you give it up because you felt the odds of success were next to nothing? Why not follow the example of these contestants who bet on themselves and put their dreams on the line? The only thing you have to lose is … regret. I recently asked my network for help with the sub-title for my book SOMEDAY is Not a Day in the Week. The winning choice? Make the Rest of Your Life the Best of Your Life. “Know what my husband said to me 18 months ago after getting tired of hearing me talk about something I wanted to do for more than a decade? I am now 1726 miles into a 3800 mile bicycle trek across the country and should finish sometime in 2019. Kudos to Jillyn for making the rest of her life the best of her life, for proving we’re never too old for new dreams. (Check out her blog Jypsy Jill Rides to be inspired by her travels). How about you dream? Are you living it or have you set it aside? What is that one thing you’ve been waiting to do you would regret not doing? And if you’re thinking, “I'll do it later when I have more time," please rethink that. You’ll never have more time than you have right now. And if you’re planning to do this when you retire, please rethink that too. One of the saddest discoveries of my Year by the Water was how many people waited to retire to embark on their dreamed-of adventure … and when the time came, they no longer had their health or the significant other they planned to share their adventure with. Put a date on the calendar NOW when you will launch your day dream. Not tomorrow. Not someday. Today. You will never regret betting on yourself and putting your day dream into motion; you’ll only regret not doing it … sooner. Many people I interviewed during my Year by the Water told me, rather wistfully, that they hoped, planned, dreamed of doing something similar … someday. When I asked why they weren’t doing it now, they gave a lot of reasons including that they felt they were "too old" and had "missed their chance." Too old? Missed their chance? I was in Aptos, CA wrapping up my SOMEDAY is Not a Day in the Week manuscript to turn in to my publisher St. Martin’s Press. After a couple of rainy days, the sun came out which meant it was time to get up, get outside, and get moving. They hitched up their trailer, told their families they’d be back in a couple days, and drove from their home in central California, a couple hours away. Sheila said, “I’m an insurance agent. One of my older clients retired last year and bought the huge, fancy Winnebago of his dreams. He drove it to my office to show it to me and to add it to his account. I watched out the window as it took him about twenty minutes to park the darn thing and get out of it. He’s in his late sixties and doesn’t move very well anymore. I asked if I could share their story because they’re such inspiring examples of why NOT to wait until later to do what’s important to us. Later may be too late. You’re right, I don’t. Here’s what I suggest though. Next time you see an arts and crafts show in your area, GO. Why? They are full of “real-life” people who are walking-talking proof that we're never too old to make our dream come true. Here’s what I mean. I was traveling through the South. I checked into my hotel on the Savannah Harbor, discovered the Springtime Craft Show was being held at the convention center next door, and went to check it out. What is the moral of these stories? None of these business owners studied these careers at college. None of them could have predicted they would turn their passion into a profitable and meaningful profession. However, all of them are grateful to have “encore careers” where they’re doing work they love that puts the light on in their eyes and puts money in their bank account. Please don’t let take regrets take the place of your dreams. Please don’t wait until it’s too late. Get clear on your dream. Ask yourself, “What could add meaning to my life? What am I good at, what do I love to do, that people would pay for? How could I turn my purpose and passion into a profitable profession? How could I craft - or cook up - an encore career where I have the best of all worlds?" Then get creative and set it in motion today … not someday. Want more ways to turn your passion into your profession? Check out Sam's book IDEApreneur. Too Busy to be Happy? Did you know a Harris Poll reports only 31% of Americans say they’re happy? An exhausted business owner told me yesterday, "I'm too busy to be happy." I told him, "Please rethink that. Happiness doesn't take TIME, it takes ATTENTION." How about you? Would you say you’re happy? I've discovered something surprising - and saddening - in my interviews with hundreds of people in the last few years for my upcoming book SOMEDAY is Not a Day in the Week. Many people feel they have too much going on to be happy. They have too many responsibilities, too many to-do's. They just don’t have the time. It also depends on whether you feel you have time for it. * feeling peaceful, content, satisfied. * being present and quietly grateful to be alive. * looking at the person you’re with – or the people you’re around – and being really glad to have them in your life. * getting up from your chair, going outside for a moment and reveling in your health and freedom of movement. * connecting with an idea, song or painting and marveling at humanity’s artistry. In other words, happiness doesn’t take time, it takes attention. Agreed. Happiness is worth a try. Is your life maxed out? Are you going from the moment you wake up to the moment you go to bed? Do you tell yourself you’ll be happy someday when you’re not so busy? Please understand, you don’t need more time to be happy. You’ll never have more time than you have right now. Stop wishing you had more time and start paying more attention. The happiness you seek is available any time you want … for a moment’s notice. You can be happier and more grateful right here, right now at a moment’s notice and in a moment’s notice. All you need to do is to be more alert to, and appreciative of, what’s right with your world instead of what’s wrong. You don’t even have to COUNT your blessings. All you have to do is NOTICE them. Are You Taking Yourself Out of Your Own Story? One reason I'm calling my new book SOMEDAY is not a Day in the Week is because it’s sad to see how many people are working themselves to death, thinking they'll relax and enjoy themselves when things aren't so crazy at work. I’m not making that up. A 2015 Atlantic article reports that job-related stress is the #5 killer in the U.S, causing more deaths than Alzheimer’s and diabetes. People promise to take better care of themselves when they're not so busy. What if that day never comes? While on my Year by the Water, I had a crucible moment that demonstrated (rather dramatically) the consequences of putting everyone else first. Hope this story motivates you to put yourself back in your own story and do something this week that brings you joy. My plan for the day was to drive California’s Pacific Coast Highway from Monterey to Morro Bay. However, work responsibilities came up that morning, so it was late afternoon before I hit the road. I didn’t think much about it until the sun went down and it got dark. And when I say dark, I mean no moon. no light. If you've taken this spectacular drive, you know about its many hairpin turns. In the day, you can see what’s ahead and adapt accordingly. But it was pitch black which meant I couldn’t see beyond my headlights. I completely lost my equilibrium because I had no idea what was coming up next. What made it worse was the road often narrowed to one lane because of construction to fix damage caused by recent landslides. The only thing between me and a thousand foot drop down to the rocks below was a rather flimsy looking guardrail. A truck zoomed up behind me and flashed its brights. I did what I always did, what I’d been taught to do growing up in a small mountain valley. I looked for the next pull-out and pulled over to let the driver behind me go by. The only problem? The pull-out was gravel. And shorter than anticipated. I braked and started sliding. I finally came to a stop a couple feet from the cliff’s edge. I sat there and shook. The truck was long gone. It was just me, the road, and my realization that my default of putting others first had just about cost me my life. Does any of this sound familiar? That was a rather extreme example of "selflessness," but on some level, is your default to put others’ needs before your own? At what cost? If you’re a business owner, executive, parent or team leader, this may have become your norm. Somewhere along the way, was it modeled for you that the meaning of life is to be found in service? There are hundreds of quotes perpetuating this belief that serving others is the right thing, the noble thing, to do. Yet serving others at the cost of ourselves is an extreme … and any extreme is unhealthy. Self-sacrifice comes at a price. We lose our equilibrium and end up compromising our health and happiness. What's worse is that when we habitually take ourselves out of our own story, we teach the people around us we don’t matter, that what we want and need doesn’t count. Is that what we want to teach? Is martyrdom the model we want to pass along? Suffice it to say, we created a written policy around her “evening office hours” that she posted and handed to her students. They still have an option to contact her in case of an emergency, otherwise there's a step-by-step process for how they can schedue time with her on campus. How about you? Are you running on empty? Burnout is a clear sign we’re not enforcing our boundaries. It’s a clear sign we are people-pleasing and putting everyone else first – and ourselves last. The good news is, it’s not too late to change this default. Next time you’re about to say yes when you want to say no – next time you’re about to give in and go along instead of speaking up for what’s important to you – next time you're about to compromise your health or safety with "No, you go ahead. You go first" .... STOP! You matter. What you want and need counts. You can be responsible to others and to yourself. You can serve others and yourself. Put yourself back in your own story. It’s not selfish. It’s smart. I am hosting SOMEDAY Salons across the country to collect real-life stories and insights from people about why they're postponing what's meaningful to them, and to inspire them to start honoring their time, health, life and loved ones now, not later. What a joy it was seeing people dive deep into the Four Minute Happiness Box Quiz and discuss their discoveries about the many important things they're putting off ... for what they think are good reasons. It's so rewarding to see people talk honestly about how they've fallen into a habit of delaying their true priorites, and to see the light go on in their eyes when they realize that procrastinating on what's important to them is a path to regrets; that the clock is ticking and if they truly appreciate their time, health, life and loved ones, they'll start honoring them TODAY, not in the far off future. They have been motivated to call long-time friends they've been promising to get together with. They've gone outside for a walk at sunset instead of turning on the TV. One picked up and played a guitar that's been sitting on a shelf for years. Perhaps one of the most meaningful emails I've received is from a woman who has always wanted to meet her soul-mate, a man she admired and enjoyed who cherished her. She FOUND HIM! He is everything she's always wanted and they're deeply in love. They had a few challenging years where he took care of his adult kids who needed him, and she took care of her parents who had health challenges at the end of their life. But now, she and her soul-mate are FREE. He's retiring and she has her own business so she calls the shots on her schedule. Somehow, having fun feels frivolous, indulgent, maybe even selfish. It flies in the face of what it means to be a responsible person who "does the right thing." What about realizing that her dream has come true and she's not honoring it? Isn't it time she put herself first? Isn't is time she revels in what's right with her life, right here, right now? Isn't it time to make her life with her partner her first priority? Do you realize it's not selfish to do something you want to do ... it's overdue? Do you realize that the best way to appreciate the precious gift of life is to enjoy it while you can instead of promising you'll do that ... someday? I'm here speaking at an event in Hawaii, and a participant asked, "What prompted you to write a book on SOMEDAY is Not a Day in the Week?" I told the group the backstory and why I am a woman on a mission on this topic, and thought you might enjoy reading it too. In 2015, I had just finished an intense two day consult. It was satisfying but I was so exhausted, I didn't know how I was going to get on the plane home that night. My son called while I was summoning up energy to drive to the airport. He sensed something in my voice and asked, "What's up, Mom?" I told him how drained I was and he said, "Mom, there's something about you I don't understand. You've created a life where you can do anything you want, and you're not taking advantage of it." Out of the mouths of twenty-somethings. He was right. I could take time off. My sons were grown and out of the house. I was single, healthy, and could do work on the road to finance my adventures. I was free to go. But you know what? Instead of changing things up, I went right back to my old habits and started filling my calendar again. It wasn't until several months later when I was driving along the Pacific Coast on my way to give a workshop, that I had a "divine intervention." And yes, I know that sounds woo-woo, but that's what happened. All of a sudden my mind was filled with an idea that wanted to be born. If there's anything I learned from 17 years of emceeing the Maui Writers Conference, it's how important it is to ink it when we think it. So, I pulled over and here’s what poured out. I will spend a week by a different body of water — oceans, estuaries, mountain streams. Each week will have a theme. Can we really not step in the same river twice? Does salt water — sea, tears and sweat — cure what ails us? Why can’t we collect all the shells on the beach? So, Chesapeake Bay, Marina Del Rey… here I come. I will interview people along the way — surfers, swimmers, sailors. I will swim with dolphins, houseboat on Lake Tahoe, snuba in Maui, sail off the coast of California. I am clear that I am supposed to set this in motion but I am not supposed to control it. I am supposed to do the opposite of my always and cooperate with what wants to happen. I sat there, stunned by the out-of-the-blue suddeness of it all. However, I realized how fortunate I was to have a crystal clear “calling” downloaded to me (with a name and start date no less) so I answered that call. In retrospect, I think another reason I was so ready and willing to make this major change was because of something that happened to my dad. My dad's dream was to visit all the national parks when he retired. As head of vocational ag education for the state of California, he was on the road 4-5 days a week driving to high schools, county fairs and farms and ranches. He was an honorable man who worked hard for decades to make a positive difference in the lives of his FFA advisors and students. A week after retiring, he took off on his long-delayed dream, and a week after that, he had a stroke in a hotel bathroom. Dad recovered from that stroke but he never did get to fulfill his dream of visiting the Smoky Mountains, Zion, Glacier and the Grand Tetons. I didn't want that to happen me. I don't want that to happen to anyone. Fast-forward to 2017. I did set out on my Year by the Water and it was everything I hoped it would be - and more. The irony is, it ended up not being about the water. It ended up being about the people I met. In particular, the people who, upon hearing about my Year by the Water, would say wistfully, "I'm going to do something like that ...someday." When I asked why they were postponing their dreams, many said, "I'm busy, I've got bills to pay, people counting on me." They seemed to think it was selfish, almost irresponsible, to do what made them happy. The problem with that? It’s based on the assumption that we’ll be able to do what we want when we’re ready. But what if we don’t? As the Buddha said, "The thing is, we think we have time." The purpose of my book (published by St. Martin's Press, Jan. 2019) is to help you get crystal clear that life is much too precious to postpone. You have a right and a responsibility to do more of what makes you happy. Please note, I’m not suggesting you quit your job, walk away from your obligations or take a year off to follow your dreams. Many of you aren't in a position to do that ... and/or you may not want to do that. The good news is, there are small things you can do right here, right now, to be happier, healtheir, more joyful and fulfilled. My hope is that by reading inspiring stories of people who decided to change their life for good; you’ll be motivated to do the same. Most importantly, I hope you’ll be motivated to put yourself in your own story and honor your true priorities. It's not selfish, it's smart. You’ll never regret taking the time to focus on what will matter in the long run; you’ll only regret not doing it … sooner. "The woods would be very silent if no birds sang except those who sang best." - Henry Van Dyke Have you been thinking about creating something - a song, poem, book, blog or screenplay - but worry it won't be perfect? But what it really came down to was … doubts. Doubts the book would succeed. Doubts that all the work would be worth it. Doubts about what other people would say or think. I added, "My favorite line from Tina Fey’s book Bossypants was when she rushing to finish a skit in her first year at SNL and Lorne Michaels told her to wrap it up. It's time for you to pick an 11:30 for your project. Because if you don’t, chances are your project will never get out the door. Our bestselling authors at the Maui Writers Conference - from Frank McCourt to Carrie Fisher to Mitch Albom - didn’t agree on much, but they did agree that they'd still be working on their books if it weren’t for their publisher's deadline. We can always tweak things. We can always make our project better. But creative work is better DONE than PERFECT. Because if you wait for it to be perfect, it will never get done. I’ve collected some of my favorite quotes about perfectionism, procrastination and creative work. Your creative project - whether it's a book, screenplay, poem, story or song - may not be the best; but it may be just what someone needs to see, hear, be reminded of THAT DAY. 22. "The meaning of life is to find your gift. The purpose is to give it away. - Pablo Picasso. Yes, getting your creative work out in the world can be scary. You know what's scarier? Regret. The world needs more people willing to contribute their creativity. We need to hear your song. Express yourself. Add to the symphony of life. "My parents always told me I wouldn't amount to anything because I procrastinated so much. I told them, 'Just you wait.'" - Judy Tenuta Are you procrastinating on something that's important to you? Why? Many of us wait for perfect circumstances to take action on our projets, dreams and goals. We tell ourselves we'll do it when we have more time, money, confidence, energy, freedom - fill in the blank. We'll never have more time than we have right now. As my mom used tell me, "A year from now, you'll wish you had started today." What is a project you've set aside that you really want to finish? What is something important to you that you've been putting off? Review these quotes. Select a favrorite and post it where you'll see it every day to inspire you to take action on something that matters to you so you're leading a life that leads to results, not regrets. Okay, I'm a roll and can't stop. Here are a few more favorites. Hope they help you realize that "Someday is not a day in the week" (the title of my upcoming book) and you choose to set something in motion today that contributes to the quality of life you want, need and deserve. Begin it today. You will NEVER regret starting a project that calls you, finishing something you can be proud of, or spending time on what puts the light on in your eyes. You'll only regret not doing it sooner.